The Hamburger Kunsthalle, supported by the Stiftung für die Hamburger Kunstsammlungen, presents for the second time an international position exploring issues related to global processes of change, identity and place in the exhibition format »Uncharted Territory«. In annual intervals, artists are invited to conceive new works specifically for the project space of the same name. The Mexican artist Jose Dávila (*1974, Guadalajara) has created seven equally fragile and imposing sculptures for Uncharted Territory – spatially expansive installations dealing with the phenomena of physical forces, balance and mass. At the same time, the works on display interact in an intriguing dialogue with the architecture of the Gallery of Contemporary Art. 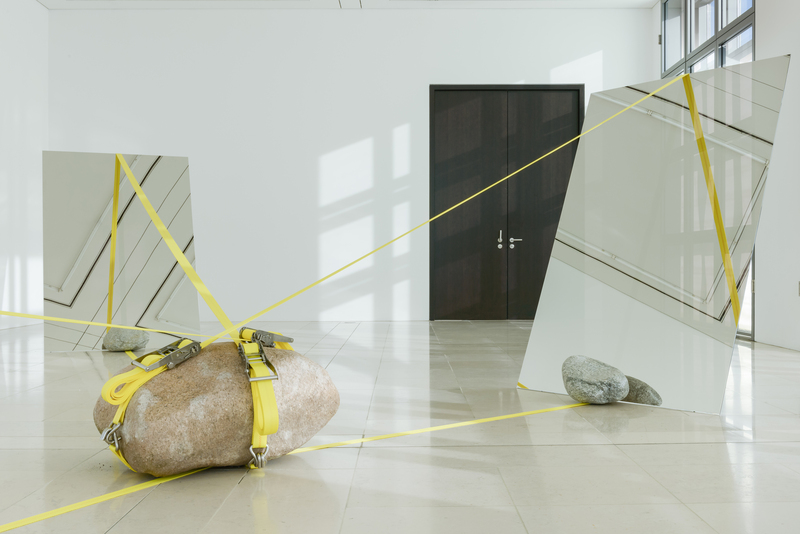 In The riddles have been unriddled (2017), Dávila has combined mirrors and boulders of varying sizes with colourful ratchet straps to form a sculpture that is stable only as a coherent entity. In the additionally acquired work, Legacy is seldom stable (2017), combinations of diverse materials and shapes, such as blocks of sandstone and boulders, are arranged in contrasting compositions. Jose Dávila is the award winner of the new international Baltic Artist Award (2017). Before Dávila, Haegue Yang (*1971) was invited to start off the exhibition series Unchartered Territory.